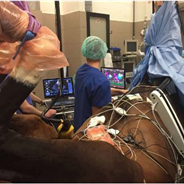 “It’s very exciting to see that there’s now a way to offer this therapeutic treatment—which has shown great success in human medicine—to equine patients, while creating many new opportunities for the future of equine cardiac medicine,” said Gunther van Loon, DVM, PhD, Dip ECEIM, Assoc. 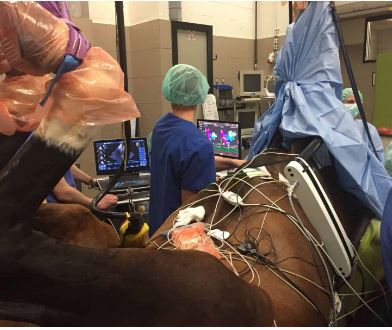 Member ECVDI, president of the Belgian Equine Practitioners Society (BEPS), head of the Equine Cardioteam, and professor in Ghent University’s Faculty of Veterinary Medicine, in Belgium. Cardiac ablation involves placing tiny catheters into the heart via the jugular vein, which surgeons access through four small incisions in the neck. They use the catheters to heat the precise part of the inside of the heart wall—usually a space of only about a half-centimeter in diameter—that’s malfunctioning and causing the irregular beats. Heating it essentially disarms it so it can no longer send the wrong electrical signals that cause arrhythmia. Precise catheter placement in such cases is critical, van Loon said. One slight error when working with the heart could lead to disaster. That’s why cardiac ablation procedures in human patients are guided by MRI, CT scan, and radiography. Cardiologists use a method called mapping to find the faulty wall area, which involves creating an “electrical activity map” of the heart in three dimensions using electrically sensitive catheters. Hearts create their own electricity to function, beat, and pump blood in perfect rhythm. But if the electrical “wiring” is faulty, arrhythmias and other cardiac dysfunction can occur. Mapping, guiding catheters into, and performing ablation in the 300-gram (10-ounce) human heart under MRI or CT are complex procedures to begin with, van Loon said. 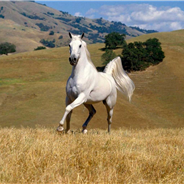 But carrying out those tasks in the 3-kilogram (7-pound) equine heart, nestled deep in the 600-kilogram (1,350-pound) equine body, presents road-blocking challenges. “You just can’t fit that huge body into the imaging machines,” he said. Van Loon and the Equine Cardioteam—made up of veterinary and human medicine specialists—were undeterred by that road block, however. Through months of research, trials, and practice, they found a way around it, mastering both mapping and catheter placement under ultrasound guidance instead. And with that knowledge and experience, they attempted the last step—the actual cardiac ablation procedure (view a video of it below)—under ultrasound guidance, as well. It worked. Diamant had had a successful career as a show jumper in Norway, van Loon said. But at some point he “seemed to lose his spark,” he said. Through attentive observation Diamant’s rider picked up on subtle signs of cardiac disease, and veterinary evaluations led to a diagnosis of arrhythmia. Despite repeated (and successful) electrical shock treatments to the heart, Diamant’s arrhythmia continued to recur. He had ongoing reduced performance and seemed generally “off,” van Loon said. Three months after his pioneering ablation procedure, Diamant continues to do well and is returning to work, van Loon. September 15, 2018 @ 1:52 PM We could not be more excited about the advances in Pet Medicine! There have been so many advances for humans it's dazzling - Lasik, artificial joint and limb, heart, lung, 3-D printing, and the list unimaginably goes on. We are so blessed to have the brilliant minds at work we do. This has not always been the case for our beloved animals. Though there have certainly been improvements there is so much more possible. This is a fabulous story about a medical break-through so we hope you enjoy learning about something new. We were at the Grand Canyon the other day and a squirrel came right up to us looking for a bite of lunch. He/She was the most playful and creative little character you've ever seen. Though ferrell he/she was virtually a pet and the antics that little character got into were just a sight. It reinforced for us what a pleasure Pets are...everyone was getting a chuckle. Even the Elk, gorgeous animals, sat right next to us munching on a twig. September 15, 2018 @ 1:52 PM For all the people who don't have a Pet in their lives exposure to them makes it more likely. If everyone on the planet owned a pet there wouldn't be enough to go around. Nirvana! When that happens the concept of animal life and animal rights will be changed for good and that will lead to food products that replace animal ones, medical breakthroughs that give them better lives, and a level of joy for we humans I think most just don't understand they can have with a Pet in their lives.